Skiers are not the only winter visitors to Jackson Hole. The National Elk Refuge sits just outside the town and provides shelter for an average of 7,500 elk each winter! A great afternoon activity is to take a sleigh ride into the refuge where you get really close to the elk, as well as other creatures that take advantage of this protected area: bison, eagles, mule deer and bighorn sheep are all regular visitors too. It’s a fun fact that you can get much closer to wild animals on a horse-drawn sleigh than on foot. The tour takes about an hour and it’s only about $25 per person – which is an absolute bargain. >> We recommend: luxury boutique hotel The Wort, for a unique ‘Western’ experience and to get closer to Jackson Hole’s (human!) locals – regulars at the hotel’s Silver Dollar Bar. The Three Valleys is one of the most famous and popular ski areas and it’s easy to see why. The world’s largest connected ski area boasts some of the best high altitude skiing in all of the Alps but even if you’ve ticked off every ski run from Saint Martin de Belleville to Courchevel 1850, the ‘3 Vallées Gourmet’ tours by ‘Ski Cool’ offers skiers the opportunity to discover some of the most unique and amazing dining experiences available in the Three Valleys. 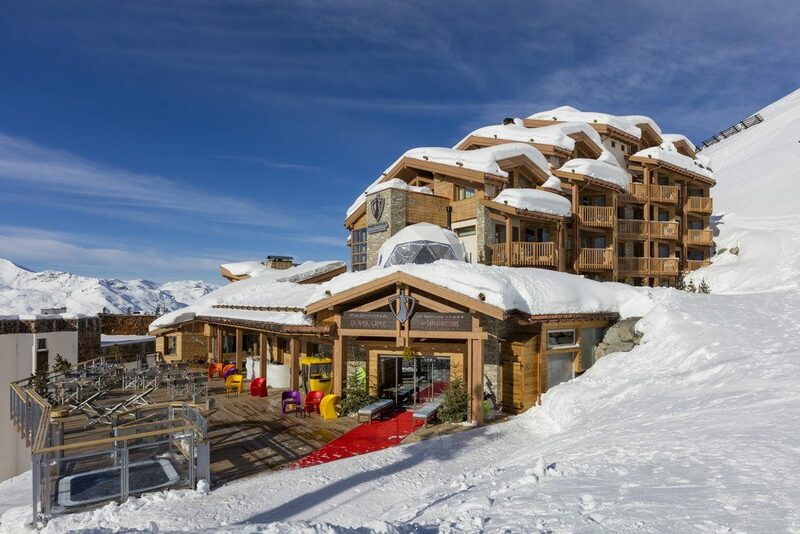 Instructors from the Val Thorens based ‘Ski Cool’ ski school take groups of skiers for either 1 day or 3 day excursions for ski guiding paired with visits to some of the resorts’ very finest on-mountain dining destinations. In March, I was lucky enough to enjoy a memorable three course lunch in ‘Le Bistrot de l’Orée’ in Méribel, paired with morning turns in fresh, waist deep powder. One of my fondest ski memories! >> We recommend: stay at the luxury 5-star Hotel Pashmina and not only can you indulge in Michelin-star cuisine, you can also pamper yourself at the L’Occitane Spa. After a great day’s skiing in the Three Valleys we discovered another way to hurtle yourself down a mountain at speed. Although open during the day, the best time to toboggan is in the evening after the slopes have closed. 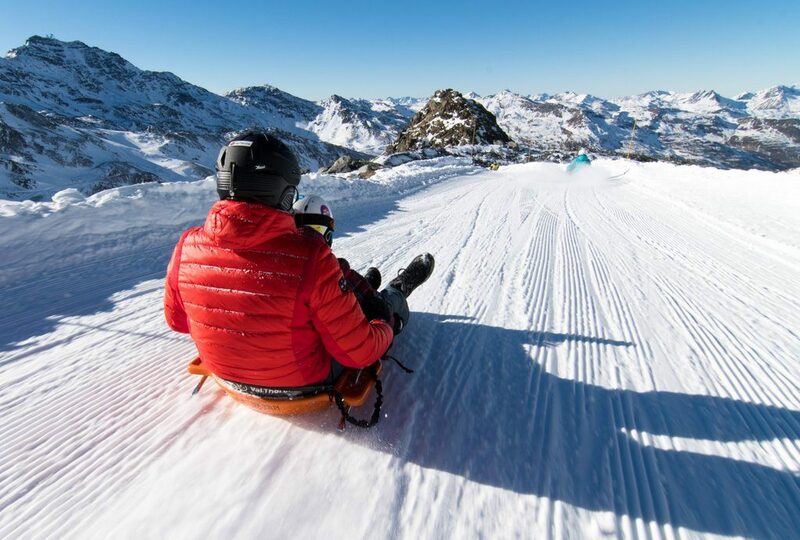 A quick ride on the Funitel Gondola in Val Thorens takes you up to 3,000m to begin your decent of the longest toboggan run in Europe at 6km. The sleds have ‘brakes’ on either side which help you steer as well as slow down. After starting off gently you can really pick up some pace and fly round corners as people’s competitive nature takes hold. There are some flatter sections which let you get back in control as well as pausing to watch the chaos behind you as people crash into the piles of snow lining the run. It’s adrenaline fuelled in a serene setting, with the run looking out over the resort in Alpine twilight. Vin chaud and cheese await you at the bottom! >> We recommend: the ultra-stylish 5-star Hotel Altapura, located right at the foot of the slopes. What better way to arrive at your restaurant for the evening than by snowmobile or being driven in a snow cat? Enjoy your journey to Crystal Hut at the top of Whistler‘s Blackcomb Mountain; here you will enjoy live acoustic music performed by local musicians, cheese and meat fondues, freshly baked deserts and spectacular mountain top views. If you’re the adventurous type then you can make your way up and down the mountain by snowmobile. However, if you’d prefer a more leisurely transfer and possibly an extra couple of glasses of wine with dinner, then taking a seat in the snow cat is a great way to make the most of the on-mountain unique dining experience. >> We recommend: the fabulous Fairmont Chateau Whistler, perfectly positioned at the base of Blackcomb Mountain, next to the Wizard Express lift. Haute Cuisine brings 10 of the worlds most renowned chefs together for a long weekend in the luxury resort of Verbier. Hosted at the stunning W Verbier hotel you have the chance to take part in cookery classes hosted by 10 incredible chefs, who have 17 Michelin stars between them, and attend events such as a ‘cocktail and cuisine night’. Here you will have your meal accompanied by the W mixologists’ fabulous cocktail pairings. 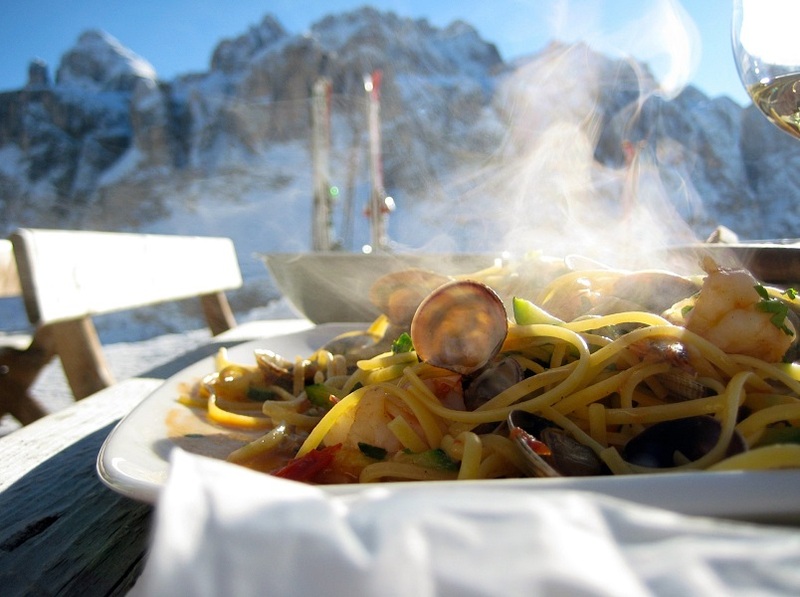 If you are a real foodie and avid skier, then keep an eye out for the next event and you could be enjoying the adrenaline-pumping mountain during the day and mouth-watering food and drink in the evening. Sounds ideal to me! >> We recommend: the impressive 5-star Hotel W of course! Skip the road traffic on the I-70 from Denver and instead hop on board the relaxing ski train. Running on the weekends, skiers can now take a 2 hour scenic ski train journey from downtown Denver right to the base of Winter Park mountain. 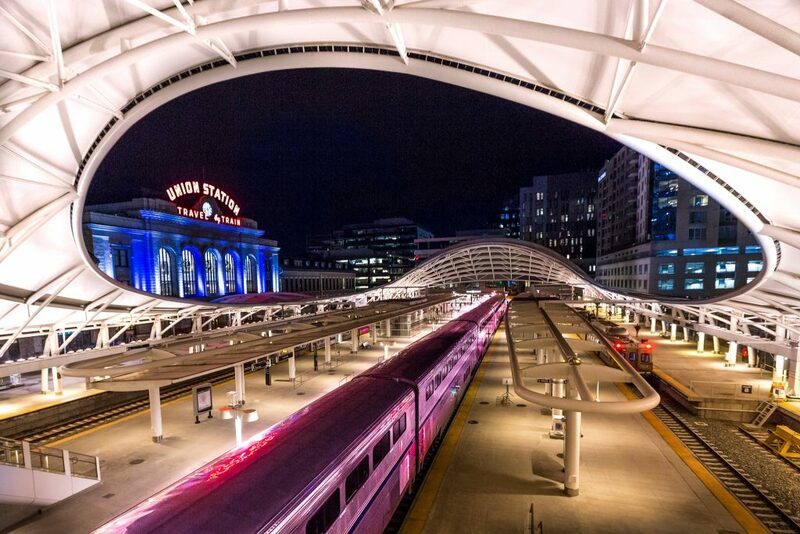 We recommend you fly to Denver on a Friday, take the new airport rail service to Union Station in downtown Denver (approx. 35 mins) and check in to the 4-star Crawford Hotel, located inside the railway station. Explore a selection of interesting bars and restaurants, located nearby and the following morning, hop on the AMTRAK Winter Park Express, leaving at 7:00am and getting to you Winter Park at around 9:00am. Drop your bags off at your property in Winter Park and then you’re straight up the mountain for a full day of skiing on day one. >> We recommend: walking distance from the railway station in Winter Park, the Zephyr Mountain Lodge is also close to the slopes and has a range of well equipped 1-3 bedroom condos. 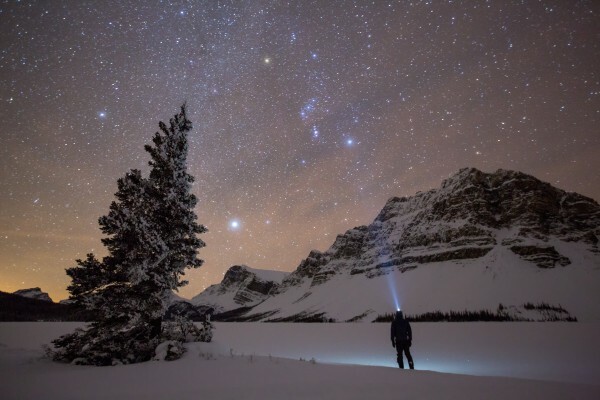 If the stunning scenery around the town of Banff wasn’t good enough, the Banff Gondola, dinner and stargazing package run by the RASC (Royal Astronomical Society of Canada) is a brilliant way to take in expansive views of the surrounding mountains and the heavens above. 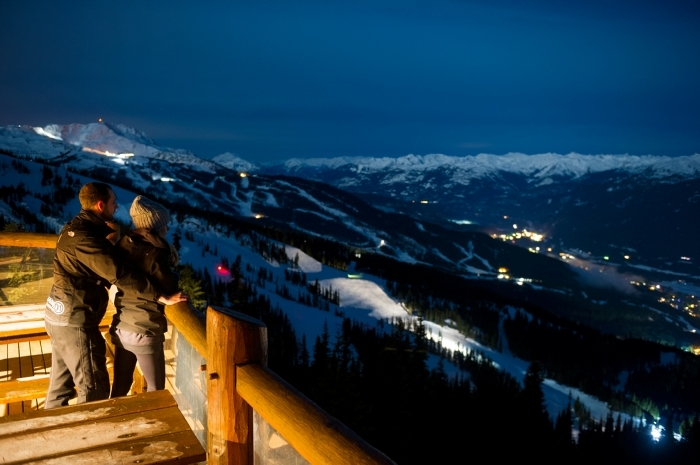 The evening starts by gliding above the treetops in a four-person gondola to the 2,200 meter high Sulphur Mountain summit centre. Once you’ve arrived at the summit and taken in the mountain views from the ridge-top boardwalk, settle in for a two course dinner in the summit restaurant. Soon after dinner, an astronomer from the RASC will lead you on an interstellar adventure with interactive exhibits and telescope views of distant galaxies, the Milky Way and our very own moon. This is a truly unique experience, and an amazing way to spend an evening in Banff. The Stargazing package (gondola, two course dinner and stargazing) is available on Friday and Saturday evenings all winter until the 9th of March, and costs £55 per person. >> We recommend: continue the stargazing by staying at the Sunshine Mountain Lodge, located right on the mountain at Banff Sunshine Village.